INTRODUCTION. Joan B. Mirviss has been an active art dealer in New York specializing in Japanese art for more than 25 years. I had an opportunity to speak with her about her experiences during her short visit to Japan.  Ms. Nishi (N): What led to your interest in Japanese art? Ms. Mirviss (M): Since my childhood, I have been fascinated with things Japanese. My parents, who are both scientists, had no interest in Japanese art or culture. But they say that from a fairly early age I was focused on anything Japanese. Two childhood memories, in particular, stand out. From our local library I borrowed a large coffee-table book on ukiyo-e prints and used the illustrations to trace designs of kabuki actors and kimono-clad women. Lessons in Japanese brush painting offered on educational television in the late 50s made a lasting impact as well. N: Was your interest only in Japan, or also in Korea and China? M: No, only Japanese art. When I was a graduate student at Columbia University studying Japanese painting, it was required to study Chinese painting as well. To me, the art of China was more intellectually focused and although I could understand and appreciate it, I could not relate to it emotionally. The Japanese aesthetic is something that I am quite passionate about. I think that I was born with this and in one sense I feel that I have never had a choice in career paths. N: How was the art of Japan perceived in America when you began 30 years ago? M: When I was young, if a product bore the stamp "made in Japan" the popular perception was that this implied something cheap. Sadly, Japanese art did not receive sufficient respect until recently. While wealthy American collectors had pervasively collected all types of Southeast Asian Chinese art in the 1940s to 1960s, it is only in the last thirty years that they began to seriously approach Japanese art. After completing my undergraduate degree in art history at the University of Wisconsin, I headed to Columbia University for the graduate program in Japanese art history. At that time there were only five PhD programs in this area in the entire United States. This has grown tremendously since that time. Now things Japanese are utterly in fashion. Japan itself has changed dramatically since the 1960s. I was extremely fortunate, as my career has paralleled the increasing popularity of Japanese aesthetics. This autumn there will be two major exhibitions on the clay art of Japan in New York -- the Isamu Noguchi Exhibition at the Japan Society, and "Turning Point: Oribe and the Arts of 16th Century Japan" at the Metropolitan Museum of Art. N: I believe that Japanese prints are considered to be fine art, but what about ceramics? M: Yes. Ukiyo-e is widely considered to be fine art, but this was not true 20 years ago. As for the medium of clay, it remains surprisingly difficult for most American scholars to assess. There has been very little attention paid by our academicians to ceramics. Recently it's changing. While very few universities have granted PhD degrees in Japanese ceramics, Harvard University, which is comparable in stature to Todai (Tokyo University), has allowed that course of study. N: I saw your site (opens new browser window) and received the impression that you are passionate about dealing with ceramics. Please tell me what led you to dealing in this area. M: Thirty years ago when I was a student, most American students would travel to Europe, but I never wanted to do that. My dream was always to go to Japan. The summer of my senior year, I found an accredited program sponsored by Syracuse University to study the art of Japanese ceramics. While ceramics held no appeal for me at the time, this was the only way I could get to Japan with my parents' blessing. Needless to say, I fell in love with this media as well. We traveled from Arita to Hokkaido, meeting with young artists as well as celebrities like Hamada Shoji located in the ceramic centers -- Mashiko, Kyoto, Hagi, Tokoname, Kanazawa and so on. It was an amazing trip and the serendipitous choice of a ceramics program later proved to be defining in my future career. (Editor's Note: See our Guidebook for more on these ceramic centers). After graduate school, when I began to regularly travel to Japan to acquire paintings, screens and ukiyo-e prints, I would pick up some contemporary ceramics here and there for my personal collection. 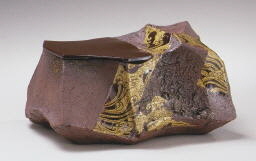 Inspired by that fateful summer trip to Japan and my days at Mashiko, I had developed an instinctive sense of the clay art form and was excited by the tactility, balance, weight and sensibility of the work created by these artists -- most especially those with their own very personal, yet contemporary visions of an ancient tradition. N: Didn't people think the prices were too expensive for applied art? M: Yes, the Japanese market prices were an issue so this aspect of my business started very slowly. It has been an educational process for both my clients and myself. Of course, in those days, the prices were a little cheaper, and the dollar was stronger. The dollar has changed so much in this period of time, and consequently, the prices in America have also fluctuated. Many of my clients began collecting clay vessels simply for utilitarian use and are now amazed to find that they have collections numbering dozens and dozens of works. They have become collectors without actually planning to do so. Over the last decade or so, I believe that decorative art (as opposed to fine art) worldwide -- antique and contemporary -- has finally become big business. A case in point -- last year the Asian Art department of the Metropolitan Museum of Art, which has a classical collection, purchased four pieces of contemporary Japanese ceramics from me. 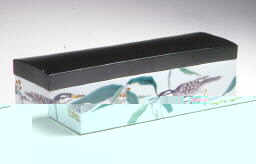 Bearing their strong traditional focus in mind, I initially offered them the celadon and seihakuji-glazed work by artists such as Fukami Sueharu and Kawase Shinobu. However I was astonished when the curators made their final selection. 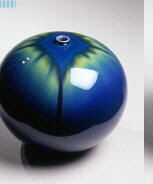 The group included vessels by Tokuda Yasokichi, Nakamura Takuo, Takegoshi Jun, and Miyashita Zenji. N: How do you locate and select the ceramic artists whose works you handle? M: I spend a lot of time traveling. In the beginning I would try to attend as many group exhibitions (like the Traditional Japan Craft Exhibition) as possible, in order to ferret out those artists whose work appealed to me. These days as those competitive shows seem to be losing their create edges, I focus more on department store one-person shows. I am always searching for the artist whose work I feel is exceptional, well crafted, beautifully balanced, creative and frankly, unique. In the end, I only buy what I like. It is essential for me to be able to feel that each item is something I would want to live with. N: So you must respond emotionally even to works you select for your clients? M: Exactly. You said it perfectly. For me, there has to be an emotional response because ceramics is an art form that may be appreciated by all of the senses, especially when actually utilized as a vessel. One can buy a Japanese painting such as a Chinese-inspired nanga kakemono and relate to it on a purely intellectual level. One can comment on the caliber of the brushwork or can note the relationship to Sung dynasty prototypes. But with clay, you have to be able to hold it, and put your fingers where the artist performed his or her magic. You have to be able to feel the balance and weight -- it is a three-dimensional art form. Of course it is always both satisfying and thrilling when a museum acquires a work of modern ceramics and shows their support of the ceramist's vision; but it's also a little sad as future visitors will be prevented from enjoying the works in their intended manner. The fact that the artist works so hard to make the perfect vessel or sculpture with fine proportions and beautiful glazing on every side, is often lost in a museum installation. But it remains important for the artist to have that exposure and have an opportunity for the public to see his or her work; so such placement serves an important purpose. N: Do you deal with both functional objects as well as sculptural forms? M: Definitely. They are all still tactile. In the case of Suzuki Osamu whose work I greatly admire, so much of the aesthetic is still about surface. While his sculptural forms do not cry out to be held, one still want to caress and touch his surfaces and edges. And even in the case of another Sodeisha founder, Yamada Hikaru, who had so many different styles, his work tends to be more two-dimensional and often has the appearance of being made of materials other than clay. However, had his works been made out of wood or metal, they would have lost their warmth. I have one Yamada Hikaru sculpture that I recently acquired shortly before his death. I saw the piece in his retrospective at the Meguro Museum and fell passionately in love. 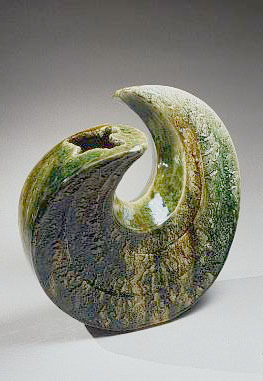 It is a sculptural form with a ladle-poured white glaze (which he did for one year, in 1982). Frustrated by my inability to touch the form and feel the presence of the artist's hands nor to see the verso of the work, I felt compelled to try and purchase it. Through a connection, I was tremendously fortunate to be able to buy it from the artist's own collection after the conclusion of the exhibition. N: Are there pieces you can't say goodbye to? M: No, I am not acquisitive. My goal is to find a good home for each piece. Of course, this means that the Yamada piece should end up in a museum. It is a masterpiece and he only made two -- or perhaps it shall be placed with a very fine collector who will one day donate it to a museum. N: What proportion of your work is involved with ceramics? M: It takes more and more of my time. The artists of the Edo period Japanese paintings and prints that I handle are no longer here to speak with. The great opportunity in contemporary art is to meet with the artist directly and have a dialogue. I very much enjoy meeting new artists, perhaps commissioning work and discussing the possibilities of doing shows. Last week, a new American museum bought a piece by Koike Shoko. So I sent her a letter to let her know that the piece I had bought from her last year is now in such-and-such museum. Needless to say, that gives the artist tremendous pleasure. Because it is contemporary art, I have to spend a lot of time looking at pieces that are, in the end, mundane. To find one piece that's at least interesting to look at takes a tremendous amount of energy and requires a good bit of travel. In my business, proportionately, ceramics takes up the most time and brings the smallest profit; but it is obviously my passion. Ukiyo-e and Japanese paintings are very important aspects of the business and I still write about both those fields, but for me personally, clay is the more satisfying medium. N: So if young artists should want to sell their work to you, can they contact you? M: Yes. I would be delighted if they want to send me some digital images and information about their work. It is very important to find new talented artists, and it is not easy especially due to the fact that I am only in Japan three or four times each year. N: Please tell me which ceramists are you visiting on this trip. M: On this particular trip, I am visiting artists with whom I have done exhibitions already -- Morino Taimei, Miyashita Zenji, Kawase Shinobu, and Kato Yasukage, whose solo show I organized last March. In his case, I wasn't sure whether Kato's Oribe green glaze is quite American taste or not. But the show was a fantastic success and sold out. 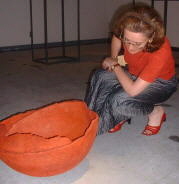 So the purpose of this visit is to orchestrate the commissions resulting from that exhibition. Then in Kanazawa, I am visiting Tokuda Yasokichi and Nakamura Takuo, and I planned to visit Takegoshi Jun but he is exhibiting at Wako next week, so I will see him at his show in Tokyo. Unfortunately I do not have enough time to go to Bizen and Hagi on this trip. Soon, I hope to get back to visit several of my favorite artists there. N: I have heard that many people who have dealt with only antique art are now shifting their interest to contemporary art. Do you agree with this preception? M: I think that in general there is some truth to this. During the boom years in the 80s and early 90s when people and museums had seemingly endless money and collected without restraint, a great deal of art went out of circulation. Hence there is currently very little available fine antique material to buy. Dealers in many fields are looking to contemporary and modern art, and enlarging their focus. Even museums are going with that. As I mentioned earlier, the Asian art department of the Metropolitan, recently acquired four 21st century works, by-passing the second half of the 20th century. Even this lofty institution is looking to expand its horizons in these days of scarce resources. And it is not just the Met. The grand annual antiques fair in London, the Grosvenor House Art and Antiques Fair, several years ago changed their vetting rules in order to allow contemporary works at this formerly stuffy venue. Now, you can find modern glass or Picasso drawings in the booth next to Queen Anne furniture. Clearly contemporary art, especially the decorative arts, is becoming more aesthetically and culturally accepted. N: What do you see yourself doing in 10 years? M: For me finding antique Japanese paintings is becoming increasingly difficult and 18th and 19th century ukiyo-e is becoming scarcer too. So my expectation is that I will continue to deal in Japanese modern and contemporary ceramics and that area will grow exponentially to become the most significant part of my professional life. N: That's good news for Japanese potters! M: Thank you. It is endlessly satisfying to find new ceramic talents and then see the response from others as they first come to appreciate the work. Focusing more of my time in this pursuit is such an exciting prospect! A new and excellent magazine just hit the newsstands and is titled "Kateigaho International." It's an upscale glossy publication devoted to Japanese arts and culture. The debut issue is simply fantastic with articles on Japanese ceramic art in New York, of course with an article about Joan Mirviss. Other articles are on moon motifs in art, Shinoda Toko, anime and Japanese inns, amongst others. You can learn more about the magazine and also ordering information by visiting their web site (opens new window).